After 3 days of discussions and deliberations, the Sixth Ministerial Conference on Environment and Health drew to a close. Around 500 delegates and observers from European Member States, plus Canada, the Philippines and the United States, and 15 international and nongovernmental organizations attended the Conference. Over the 3 days, the participants took stock of the progress made on environment and health in the WHO European Region, as well as committing the Region to further action, culminating in the signing of the Ostrava Declaration. The first session of day 3 opened with Dr Lukáš Ženatý, Ministry of the Environment of the Czech Republic, presenting the Slezsko project, a pioneering example of cross-border collaboration on environment and health, addressing risk assessment and management, and defining priorities in the areas of air pollution, surface water pollution and food contamination. building the environmental sustainability of health systems. The Ostrava Declaration is supported by two annexes: a compendium of possible actions to advance the implementation, and institutional arrangements for the EHP. Jan Dusík, United Nations Environment Programme, then moderated a panel discussion, including interventions from the floor, which covered issues such as sustainable social entrepreneurship and the importance of civil society engagement. Sergei Kraevoy, Deputy Minister of Health of the Russian Federation, identified 3 principles to support implementation of the Declaration: 1) to create a national legislative base; 2) to ensure adequate resources; and 3) to build a strong evidence base to support action. The final session of the Conference saw Member States, organizations and networks support the Ostrava Declaration. The WHO European Healthy Cities Network and the WHO Regions for Health Network jointly expressed their full support for the Declaration, noting that tackling health inequalities and inequity through its implementation is essential to achieving sustainable development. The European Environment and Health Youth Coalition, the Netherlands, Georgia and Israel also all gave statements of support. 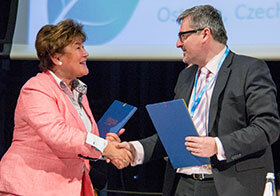 Shortly after noon, on Thursday, 15 June 2017, the Declaration of the Sixth Ministerial Conference on Environment and Health was adopted by acclamation, and subsequently signed on behalf of the Member States by the Deputy Minister of Foreign Affairs of the Czech Republic, and Dr Zsuzsanna Jakab, WHO Regional Director for Europe. Dr Jakab noted that although the signatures are a symbolic gesture, they commit us to make Europe a safer and healthier place. The EHP owes its durability over the past 30 years to its adaptability under changing contexts. It has been and continues to be a learning process, and the Ostrava Declaration will open the doors to greater engagement with civil society. She expressed her thanks to Robert Thaler and the Environment and Health Task Force and Ministerial Board for driving forward the process. In conclusion, Dr Jakab recognized that we have many priorities for action, but one commitment, and all Member States need to move forward on implementation.